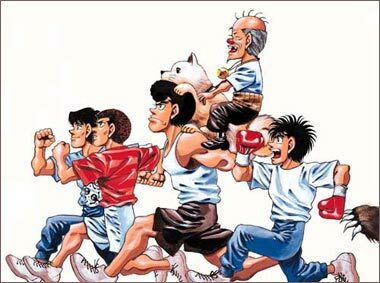 16 yr. old Ippo Makunouchi uses all his spare time to help his mom and the family business. He is a good worker and obedient son. However, he is often picked on by bullies from school and most of the time gets beaten up. 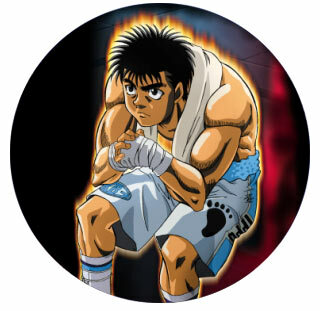 During one beating, he is rescued by Takamura, a professional boxer. Takamura shows Ippo a couple of steps and when Ippo launches his first punch to the punching bag he burns with desire to learn how to box. He passes one of Takamura's tests and Takamura has no choice but to train the kid. Shades of Ashita No Joe! Fighting Spirit is a very nice mix of Rocky and The Karate Kid. The episodes have a good level of story line and humor. The characters are all likable and the animation is superb. As the title claims, the characters are normal people and no one has super human powers - just strong human will and determination. The soundtrack is excellent, especially the opening theme.